Supports DVB-T/DVB-H, ATSC 8VSB, QAM(DVB-C & USA-QAM), DVB-S/DVB-S2, CMMB,, T-DMB, ISDB-T, ISDB-Tmm, ISDB-S, DTMB, ATSC-M/H, DVB-T2, DVB-C2 and DVB-S2X modulation standards ! 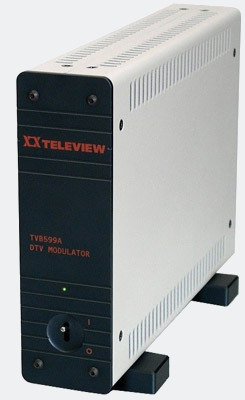 The TVB599A is USB based modulator that can play Transport Stream (TS) files from hard disk or DVB-ASI/SMPTE-310M/IP inputs into an RF signal. The output can be industry standard 55~2150MHz selectable RF signal. On board synthesizer can generate stable and accurate symbol clock and tuning frequency. The transport stream can be supplied through USB interface or DVB-ASI/SMPTE-310M/IP inputs. Ideal for STB testing and development, or video distribution to closed RF networks.